As we all know, speculative fiction stories are tough to categorize. That is particularly evident in the Wilde Stories 2011: The Year's Best Gay Speculative Fiction collection of 14 stories gathered and edited by Steve Berman, where you will find horror intertwined with weird fantasy, weird fantasy love stories, and even a mix of science fiction and pop culture. It is also true that often within fantastical, horror-based and science fiction tales, the reader will find underlying pertinent social commentary. There’s no question that weather it is the subject of acceptance of the gay lifestyle by loved ones or society, bullying, child abuse or neglect, loneliness, love or loss, those social commentaries can be found in this collection. However, also present is the subject of love. Gay love or related themes are there for the reader to find in most of the stories, entwined with the fantasy, horror and science fiction. Two excellent examples of spec-fic fantasy and sci-fi with that underlying social commentary are Map of Seventeen by Christopher Barzac, a story about young woman who struggles to understand her hidden powers, society, and her gay brother's choices, and written for all those who feel they're different or outsiders, How to Make Friends in Seventh Grade by Nick Poniatowski, a touching sci-fi story about two boys, extra terrestrials, a science project, friendships, self-deception, acceptance, and fantastical solutions. And of the weird fantasy stories with an underlying love theme, the surprisingly touching How to Make a Clown by Jeremy C. Shipp has to be a favorite for me, as is Mortis Persona by Barbara A. Barnett's fantastic mythology-based story dealing with love of the "forever" kind. I love my science fiction and there's nothing like weird fantasy, however horror is not usually the first choice in my reading agenda. Which is why it came as a total surprise when some of the stories I enjoyed the most fell under the horror-based category. Horror-based stories and weird fantasy rule the day in this collection with science fiction coming a distant last with only two contributors -- my one small niggle because of personal preference. However, there’s quantity and then there’s quality and those two science fiction stories are excellent! From the horror-based stories there's the jewel called Mysterium Tremendum by Laird Barron. This is the longest, and one of the creepiest, most atmospheric novellas in this collection. It kept me on the edge with its compelling rough and tough gay characters, a touch of the occult, and excellent pacing and action to its creepy, heart-pounding end! And of those two excellent science fiction short stories, the highly creative Beach Blanket Spaceship by Sandra McDonald with its combination of fine sci-fi and excellent 1960's pop culture details really worked for me. There's a lot more in this collection that should be mentioned, such as the Dracula-based vampire historical tale Hothouse Flowers by Chaz Brenchley, Alaya Dawn's creepy romance between a flesh eating zombie and a hunter, Love Will Tear Us Apart, or on the other side of the spectrum a story that haunted me with gentle terror, Joel Lane's All the Shadows. Then there's Oneirica by Hal Duncan, a strangely fantastical story full of allusions to myths and mythological characters that meanders like a dream from one plane to another -- past and present, myth and reality -- until the reader, like the characters who lose themselves through time and corridors, also loses his/her bearings. 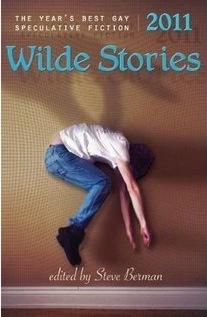 With Wilde Stories 2011: The Year's Best Gay Speculative Fiction, Steve Berman gathered a collection that encompasses everything I've come to expect from LGBTQ speculative fiction. There are the thrilling and chilling moments that come from horror, the confusion and sudden realizations that go hand in hand with weird fantasy and that incredible wonder that I never cease to experience when reading science-fiction, all of it successfully combined with pertinent gay themes and wonderful characters. However, none of the above would happen without successful execution by the authors, and Berman included some of the best along with fresh new talent in this collection. I loved it and recommend that the collection be read slowly for better enjoyment. Highly recommended. Another good one. This has gone on my list of to reads, but I likely won't be able to get to it until the new year. It's intersting that while I enjoy speculative fiction as you do, we are reversed in our prominent sub-genre tastes. My preference is for horror (I love my scary stories the most) and weird(er) urban fantasy with less of a personal taste for sci fi. Question - are the stories mostly YA-focused or is there a mix in respect of age range? To answer your question, the collection is a mix in respect to age range, but most of the stories could be read by both. Orannia, yes! Excellent writing and great stories too.